In HSMAdvisor starting from version 0.750 it is possible for sevaral HSMAdvisor seats to share the same tool and cut library (myCutDB). All you need to do is tell all HSMAdvisor seats where the shared database file is located. And then check "Shared Database" option in settings page. This will make all seats use this file in synchronous mode. Which means changes to the DB made on one computer will automatically propagate to other computers as well. Please check out this tutorial i made for calculating speeds, feeds and engagement when pocketing. NOTE. THIS INTEGRATION MECHANISM HAS BEEN DEPRECIATED AND REMOVED FROM HSMADVISOR. One of the most requested features in HSMAdvisor has long been integration with various CAD/CAM solutions available on the market. There are two possible ways of achieving said task. First way: using CAD/CAM API to create plugins to enable HSMAdvisor to "talk to" various software packages. This road could produce the best results, however implementing it would be laborous and results not always very convinient to use. Also developer(me) would have to create plugins for many dozens of cad/cam software packages. Muliply that by the fact that with each CADCAM release, a new version of plugin would need to be produced, tested and debugged. This work is for a whole software department and would call for a product far more expensive than what a lot of my customers could afford. Second way: Grab tool, speed and feed data directly from the CAD/CAM window, process it and then update required information when the calculation is done. This solution is easyer to implement and could prove to be the most convinient for user as well. Need i tell you that i have chosen to go the easy way? Without further delay let me introduce the first Speed and Feed calculator that can be integrated with a CAD/CAM solution by a user himself! Step One: User launches CAD/CAM solution. We will use MasterCAM x2 in our case. A toolpath is programmed the usual way, a proper tool is selected and when it is time to enter your speed and feed data you launch HSMAdvisor. I have been asked to create a tutorial on how to work with the tool library, so here it is. myCut Tool Database is quite a unique thing. It not only contains all of your tools, but also each and every tool can have multiple operations or "Cuts" attached to it. Each entity behaves according to specific rules and "knows" specific kind of data. If you are working in mold-making, prototyping or even in a job shop you have had to use unusual form tooling before in your life. Form tooling is often used to machine undercuts and other features on regular 3 axis machines that would otherwise require a multi axis machining centre or are not machinable o at all. The classical example of a form tool is a tear-drop ball mil, also known as a "lollipop". It has a tip with a certain diameter and a much smaller shank that produces enough clearance to machine undercuts on straight walls. 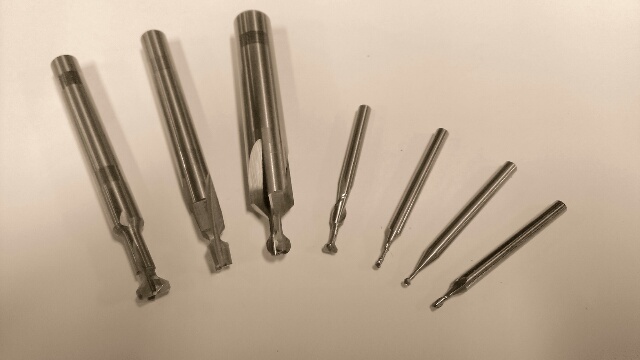 It can also be used to regular surface finishing and 2d milling. The main thing to consider when machining with reduced shank end mils is deflection and torque. While deflection is especially dangerous for long tools, torque becomes much more important for tools with severely reduced shank. Torque required to break a tool is directly proportional to the diameter of its shank. And when shank diameter is much smaller than the tip diameter it does not matter how short that weak portion is: unless you compensate for it you will snap the tool. The first thing that crosses the mind in many such cases is "I gotta run this tool very slow". It may take forever, but in many cases job gets somewhat done. Contrary to that many experienced machinists have been proponents of different approach. Instead of reducing feed rate to the point of rubbing and below, it is much more productive to reduce cutter engagement if possible and leave feed rate settings largely unchanged. Trying to keep proper chip load is even more important when machining work-hardenable materials like stainless steel and titanium. In those cases rubbing is not just unproductive, it leads to a very premature, in many cases instantaneous tool failure. Just how much of a cut is possible to take in each particular case is the black magic that separates beginners from seasoned pros.